Well, we're back from Plaistow. Which is quite surprising because apparently they've had four shootings recently, and half the people we met looked like they'd kill you for the loose change in your pocket. But apart from that it was lovely. If you like rubbish in your front garden. We were actually there to visit Lisa's friend 'C' for the day. This is only the fourth time I've met her, but having already snogged her on the concourse at Embankment tube station, I feel I can consider her a friend of mine too. And I think she likes me better without the moustache. Anyhoo, C is a lovely young lady who lives in a lovely little house in a lovely little street. Unfortunately the street's in Plaistow, but you can't have everything. The good news is that she didn't tell us about the recent muggings in broad daylight until after we'd walked there from the tube station. So having arrived half an hour late, but thankfully alive, C went to prepare our lunch, while Lisa and I got to know 12-year-old Jasmine. I have to say I loved Jasmine. Lisa did too. To be honest, we'd like one of our own. I thought at first she'd be too old to bounce on my knee, but I gave it a go and she seemed to like it. After which she asked me to share my lunch and then started sticking her bottom in my face. Did I mention that Jasmine's a cat? Anyhoo, after lunch I vacated the premises so that Lisa and C could have a girlie chat (possibly about me, I'm not sure), and deciding it wasn't safe to stay in Plaistow, I decided to make the most of my Travelcard by heading east to Upminster. My Mum used to work in the animal trade two miles down the road from there, so I know the area well. It's my old charity shop stomping ground, and it was nice to be back. Most of them shut at four on a Saturday though, which was a problem as I didn't get there until ten past. But I like Upminster. It's the only place I know which has a Bang & Olufsen showroom next door to a branch of Smokers Paradise. They also have a Christian bookshop called Fools, which is just inviting insults if you ask me. They might as well call themselves 'Deluded' and have done with it. Anyhoo, having spent an enjoyable hour in Essex, I jumped back on the tube, travelled four stops in peaceful solitude, and arrived at Dagenham. Where two hundred Peterborough fans boarded the train, having just watched their team beat Dagenham & Redbridge 3-2 to go top of League Two. I have to say, you haven't really lived until you've been trapped in a moving metal box underground for fifteen minutes with a horde of drunken football fans chanting "WE ARE TOP O' THE LEAGUE! ", and singing 'When The Posh Go Steaming In' at a decibel level that would have made a deaf man reach for the ear plugs. 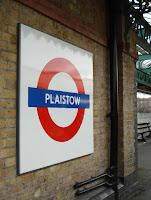 Frankly I was praying for the safety of Plaistow. But the good news is that having survived that, I was able to exude enough confidence to walk back to C's house at dusk without being knifed. Whereupon I collected Lisa and got the hell out of Dodge.